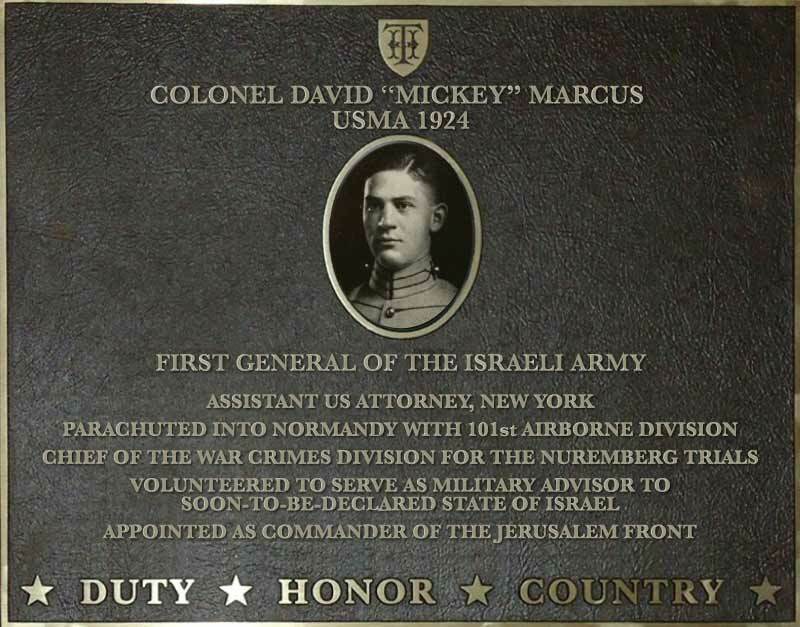 David "Mickey" Marcus was a West Point graduate, American military hero and then led Israel to its independence as the first Israeli General. He died from friendly fire at the end of leading the 1948 war for Israel's independence. His story was immortalized when he was played by Kirk Douglas in the Hollywood film "Cast a Giant Shadow". Mickey Marcus was born February 22, 1901 in Manhattan and attended Boys' High School in Brooklyn. He was accepted to West Point in 1920 and graduated in 1924. After completing his active duty he attended Brooklyn Law School. He spent nearly a decade serving in New York as the Assistant United States Attorney. In 1940 he was appointed as the Commissioner of the New York City Department of Correction for the City of New York. After the Japanese attack on Pearl Harbor Marcus was recalled to active duty where he initially served as the Governor of Hawaii. He later was assigned to the Pentagon to plan the establishment of governments after the allies liberated European countries. He participated in Operation Overlord and jumped in with the paratroopers of the 101st Airborne invading France on D-Day. He helped draft the surrender terms for both Italy and Germany. After the war ended, he was named Chief of War Crimes Division planning the legal and security plans for the Nuremberg Trials. In 1947 David Ben-Gurian asked Colonel Mickey Marcus to identify and recruit a military advisor to the new Jewish Army, the Haganah. Instead of recruiting another, Marcus himself volunteered for the position. In 1948, the US War Department approved Marcus' undertaking provided he disguise his name and rank to avoid problems with the British Mandate of Palestine. He arrived in Palestine in 1948 under the alias "Michael Stone". He was appointed May 28, 1948 as the Commander of the Jerusalem Front and given the rank of Aluf which was the equivalent of Brigadier General. On 11 June 1948 just hours before the cease fire ending the war for Israel's independence, Marcus was returning through Israeli lines when he was fired on by friendly fire and killed at age 48. The resulting investigation showed he spoke very little Hebrew and did not likely understand the challenge and password, and was killed by his own troops. Colonel Mickey Marcus was the first Israeli general officer in the Israeli Army and is a celebrated American and Israeli military hero. He is buried at the West Point Cemetery.